I have a confession to make. I have a terrible memory when it comes to my childhood. I seriously don’t remember anything that happened before I was in high school unless it’s associated with a song in some way, or I’ve seen pictures of something that happened. It’s a terrible problem to have, especially when my family starts talking about, “oh remember this,” and I have no recollection of it whatsoever. There are very few things that I remember my mom cooking when I was growing up, not because she didn’t cook, but because I just don’t remember them. One of those things is pizza loaf and still my favorite meal to this day. 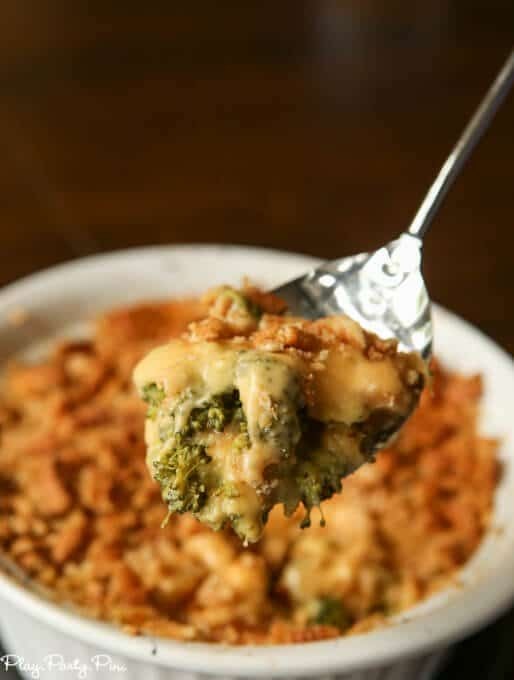 One of the others is this broccoli cheese casserole that we had probably once a week. 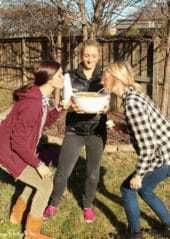 I’ve tried to make it myself numerous times and realized that I had no idea how she made it, so when we were in Kansas last week I made her show me how to make it. While I may have made it a little fancier than her version with a homemade cheese sauce, it’s still one of the easiest meals ever. 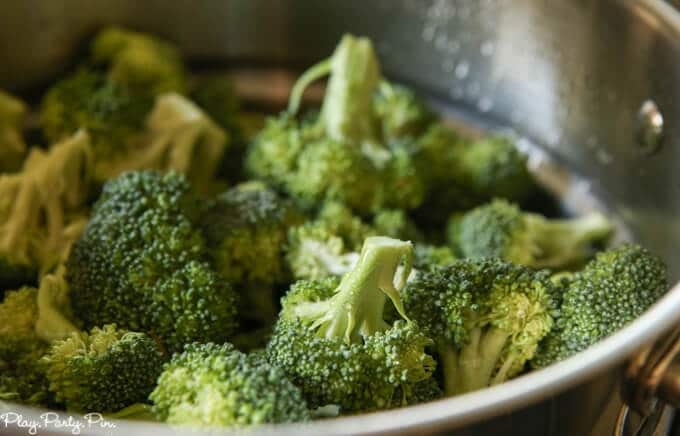 And like most casseroles, it combines most of your food groups in one dish – meat, veggies, dairy, and bread – so there’s no need to cook a side of veggies. And I’m all about easy meals that I can cook in one dish, perfect for busy weeknights! 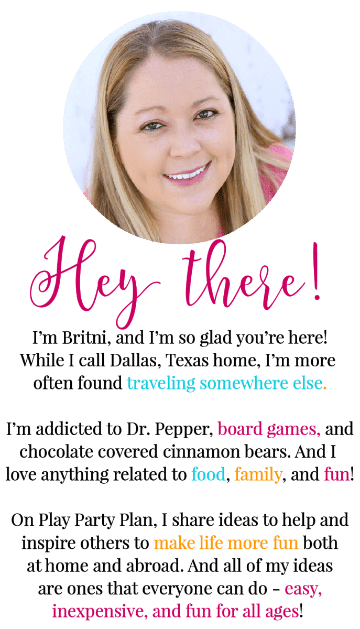 And that’s perfect because I’m actually giving away one lucky reader said dish – a Le Creuset casserole dish – so make sure to read all the way to the bottom! The first thing you have to do is gather all of your ingredients, which isn’t very many. Once you’ve gathered everything, prep all of your ingredients. 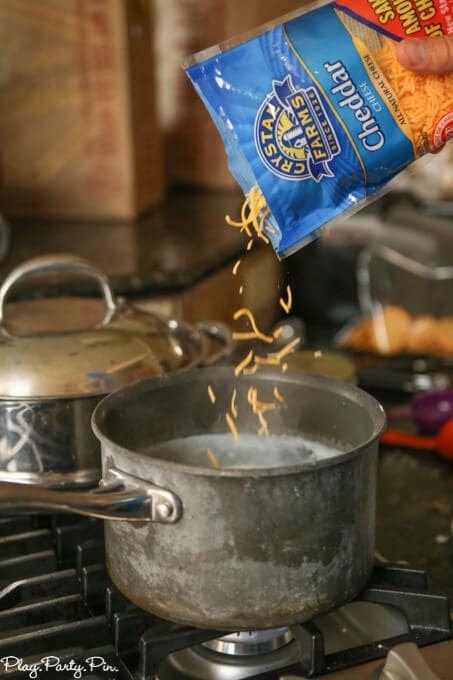 Cook and cut up the chicken, steam the broccoli, and make your cheese sauce by combining Crystal Farms Cheddar Cheese with a homemade roux. 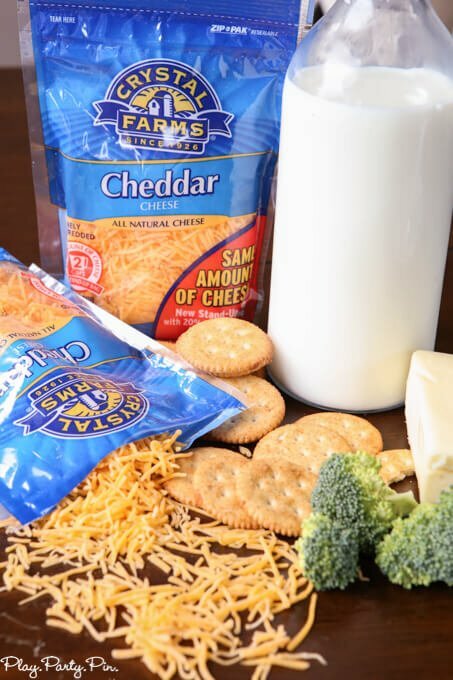 You can find Crystal Farm’s Cheese in the refrigerated section of your local grocery store and can feed it to your kids without any regrets since it’s rich in calcium and low in preservatives! 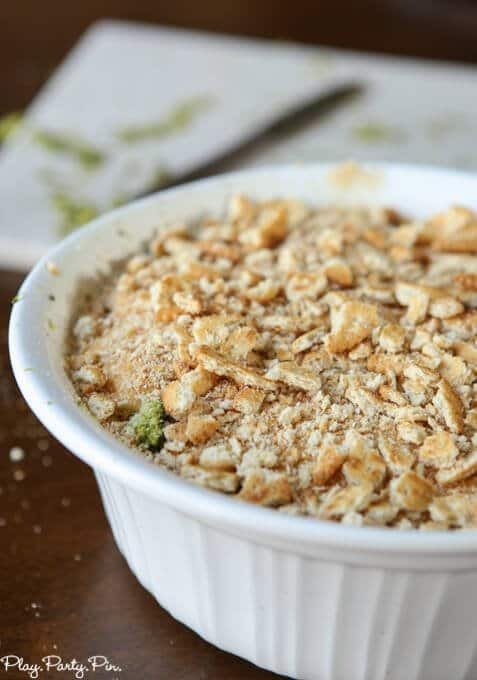 And then it’s as easy as layering it all together like a broccoli cheese casserole topped with crunched up crackers. Bake it for a little while and out comes a crunchy and deliciously gooey dinner that everyone will enjoy. And while it’s baking, check out these other amazing Crystal Farms on Facebook or follow along with Crystal Farms on Pinterest or Crystal Farms favorites. 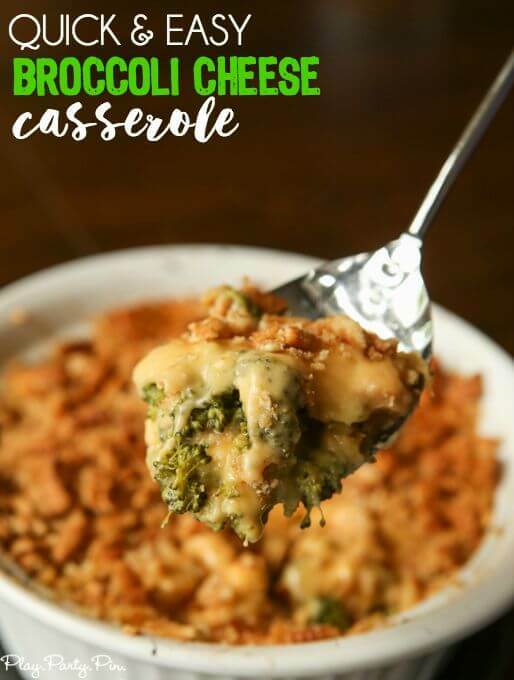 And don’t forget to enter the giveaway below for your chance to win an amazing Le Crueset 10.5″x7″casserole dish that’s perfect for this recipe! Melt 1 TBs butter in saucepan over low heat. Once bubbly, add flour, salt, and pepper and stir until combined. Spray large casserole dish all over with non-stick spray. 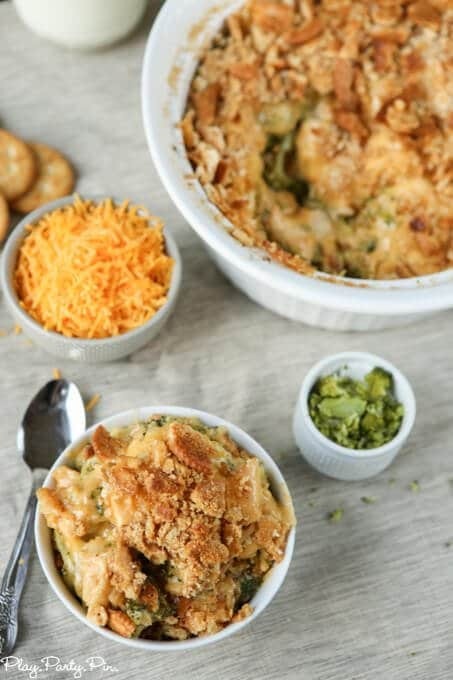 Once all of your ingredients have been prepped (steam broccoli, make cheese sauce, cook chicken, crush crackers), add half of your broccoli and half of your chicken into the prepared casserole dish. 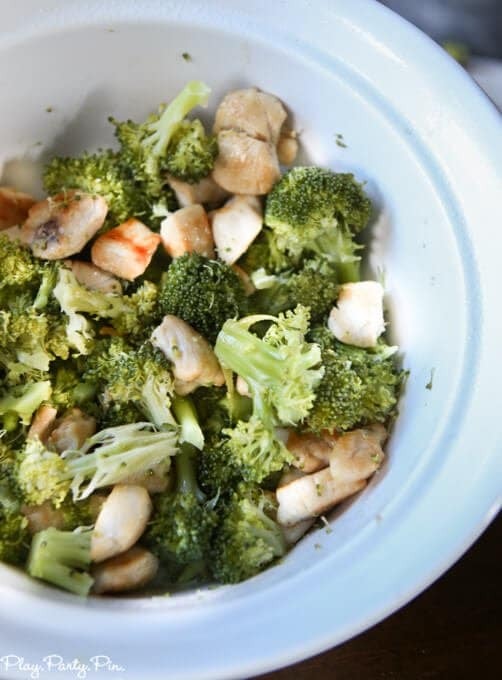 Mix the chicken and broccoli together into one single layer. 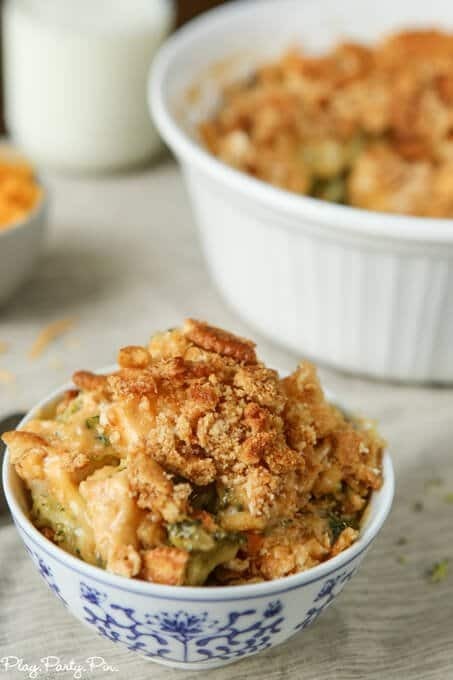 Top chicken and broccoli layer with half of your cheese sauce, making sure to cover the entire chicken layer with cheese. Sprinkle half of your cracker crumbs over the cheese layer. Repeat so you have two "layers" of casserole. Top final layer with the other 1/2 cup of Crystal Farms shredded cheese. 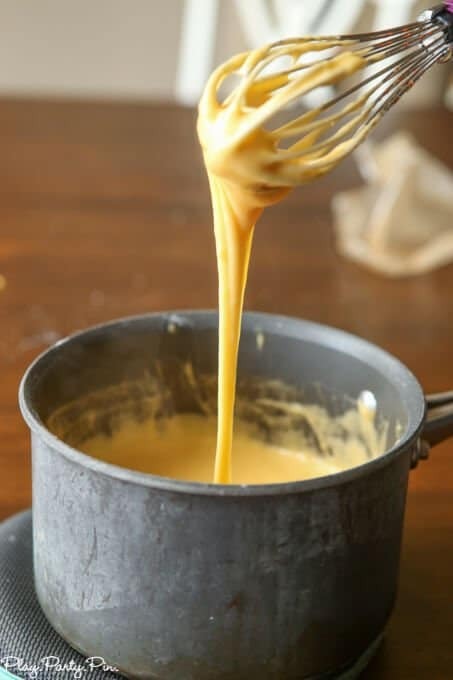 Melt the other 1 tablespoon of butter in the microwave and pour over the top of the casserole. 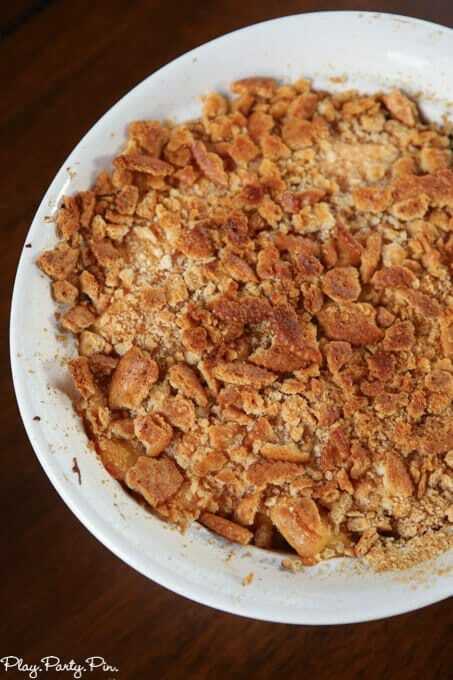 Bake casserole at 350 degrees for 25-30 minutes or until the top cheese is melted and the cracker crumbs are browned (but not burnt). This was my favorite meal growing up as well! When I make it now (which isn’t very often, but don’t ask be why) I don’t even stream the broccoli beforehand. That way it doesn’t get too mushy-but don’t tell my mom I said her broccoli was overcooked! I made the cheese sauce in the microwave. Even easier! Oh good, glad it worked! Yum! 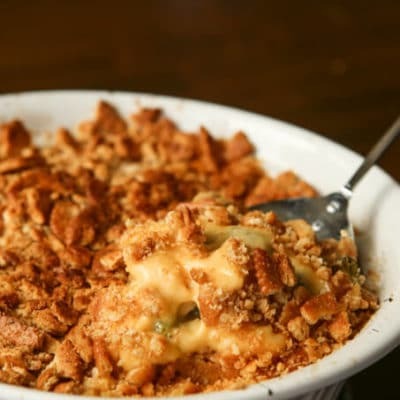 This is similar to a casserole I have made that used Velveeta and instead of adding the crackers on top, we mix it all together. 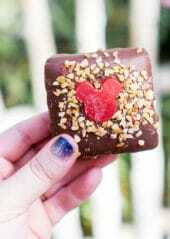 I’ll have to try this version, it looks super tasty! It’s great that you finally learned how to make it. 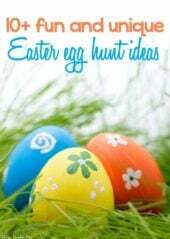 And, that now we can try your mom’s recipe too! It sounds wonderful!